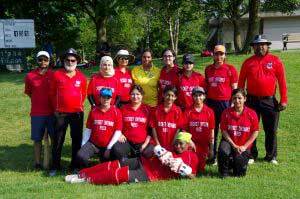 The recently concluded inaugural Canada Day Cup 2018 featuring women cricketers from across Canada and the USA, was an organizational success on many fronts, but more so the potential for a lasting platform for women’s cricket in Canada and the USA. 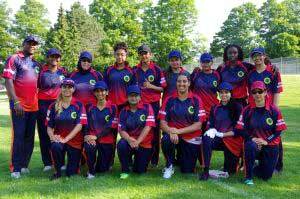 The T20 tournament held during the Canada Day weekend, saw four groups of women cricketers mainly from the Canadian provinces of Ontario, Alberta, Vancouver and British Columbia, in addition to players drawn from across the USA. 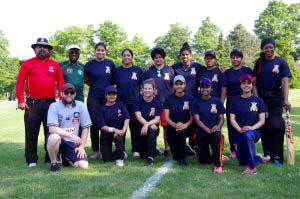 Ontario with the highest concentration of women cricketers fielded two teams – Ontario Red and Ontario Green, while the Strikers represented the Province of Alberta. Rounding out the four playing squads, was the JaJa Jaguars, a combination of players from the USA, Vancouver and British Columbia. From an organizational perspective, it was a well-organized event that no doubt tested the endurance of the organizers, as much as it tested the players in the 95-98°F weather. The organizers provided very comfortable hotel accommodation for the visiting Alberta Strikers and JaJa Jaguars, as well as match day lunches for all. No doubt the collaborative effort of the Ontario Cricket Association, Toronto District Cricket Association (TDCA), Alberta Strikers and Tranzac cricket club, and volunteer family groups. What’s more remarkable is how they were able to pull off the three-day tournament on such short notice, so as to coincide with Canada Day 2018. 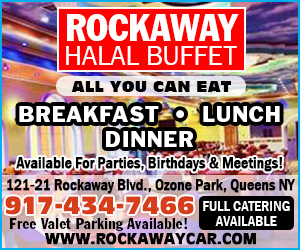 There were no doubt some logistical speed bumps, but in the end, any hiccups experienced by the organizers were hardly noticed by the players, their coaches and managers. Played at the G. Ross Lord Park located about 20 miles outside of downtown Toronto, the tournament had early morning match starts, so as to maximize the window provided by the TDCA for the use of the two adjacent pitches. The women’s matches were slotted in between the regular men’s season cricket fixtures, with two matches for each of the four teams scheduled for the first two days. The end result showed that Ontario Green would most likely emerge the tournament winner, and the Ontario Green did so, based on their dominating performances against the Alberta Strikers, Ontario Red, and the JaJa Jaguars. Ontario Green’s Canadian national player Trisha “Bess” Livia turned in some outstanding power-hitting cameos and an unbeaten knock of 62 in the final against the Ontario Red. The Green completed a sweep of all of their opponents during the tournament and no doubt gelled as a team. In the first match of the tournament Ontario Green bowled out the Alberta Strikers for 52 in 17.1 overs and easily raced to victory in 7.1 overs behind Bess’ 23 and Achini Perera’s 10, with Extras contributing 20. Meanwhile on the adjacent field, the JaJa Jaguars was not having a day in the sun against Reds. The Ontario Red posted a tournament high of 130. Nicole Samuels, 32, Miryam Khokhar, 13 and Srishthi Raha, 10, contributed to the triple figure score. The Jaguars delivered a wide variety of balls, contributing a tournament high 53 extras, including 37 wides. In response the JaJa Jaguars could only muster 84 with Swati Mishra, 16, the only batswoman to reach double figures. There were 37 Extras. In the Day 1 afternoon matches, Ontario Green turned in yet another impressive performance, posting 93 for 9 in 20 overs, with Maliha Baig contributing 16, rivaled only by Ms. Extras with 41. The Ontario Red responded with 68 all out behind Suboor Khan’s 17, and Habeeba Bader’s 14. There were 22 Extras. The Alberta Strikers dueled it out with the JaJa Jaguars, as the latter reached 89 for 6 in 20 overs with USA national player Sugetha Chandhrasekar, 31, and Extras 22 headlining. The Strikers losing six wickets reached 90 and the victory in the 19th over behind the bat Divya Rawat Saxena, 26. The loss placed the Jaguars as the only team without a win in the tournament at that stage. The JaJa Jaguars did not fare any better against the dominant Ontario Green in their third encounter of the tournament. Batting first in a fixture reduced to 15 overs, the Jaguars posted 69 for 6 off the 15 overs. , 17, and Jyotsana Dixit, 11, along with Extras 21, reached double figures. The Ontario Green coasted to 72 and the victory in 12.1 overs with Bess, 25 and Achini Perera, 24, teaming up with Extras 22, for the team’s third straight victory in the tournament. Playing the full 20 overs on a parallel field, the Ontario Reds tallied up 94 all out, with Miryam Khokhar, 22 and Nicole Samuels, 11. In reply, the Strikers came up 13 runs short with Divya Rawat Saxena, 16, Harshini Chowdry, 15, and Karima, 11, along with 24 Extras, contributed to the team’s 79 for 5 in the 20 overs. As the tournament wound down, it was the last placed JaJa Jaguars with the only chance to redeem itself with a third-place win against the Alberta Strikers who had earlier beaten them. The Jaguars with first-strike posted a decent 93 for 5 in 20 overs. Would it be enough to come away with 3rd place? After all, the Strikers had chased down 89 from the Jaguars in their earlier encounter, and won. However, a determined Jaguars behind a solid 37 off the willow of Sugetha Chandhrasekar, an exhausting 11 from skipper Delkash Shahriarian, and helped by an errant 29 Extras, reached 93 for 5 in 20 overs. With confidence no doubt, the Strikers took to the middle, but lost wickets steadily, as the Jaguars’ bowlers found their lines, lengths, pride, and confidence, bowling the Strikers out for 73 in 18.5 overs. Savneet Kandola with 13, was the only player to reach double digits for the Strikers. The Jaguars chipped in with 29 Extras. The JaJa Jaguars had finally gotten the monkey off of its back and peeled off a third-place finish in a very competitive tournament. A spirited Ontario Green clashing with their Red counterpart in the championship final, cruised to 113 for 2 in 20 overs. It was the second highest team total of the tournament. The indomitable Bess (Tournament MVP) racked up an unbeaten 62, while Achini Perera contributed 28. They both nudged out Extras 14. The Ontario Red had one last chance to have a go at the championship gold, but the Greens was not having any of that, as they closed out the Reds at 59 for 8 off the allotted 20 overs. Nicole Samuels, who contributed 13, and Extras 12, reached double figures, as the Ontario Green raced home to the inaugural tournament championship title. It must be music to the ears of all of the players, as they need to keep playing if the sport among women is to advance in North America. It was an excellent platform provided for the four participating teams of players, as well as cricket coaches, managers and other administrators, to make note of what’s needed to keep the women’s game alive and growing. The Canada Day Cup for women will hopefully expand opportunities for women cricketers not only in Canada, but across North America. It may very well be the catalyst for an Auty Cup between the USA and Canada, similar to that of the men’s rivalry between the two countries, for almost three decades. Such a bi-lateral event would certainly give a boost to women’s cricket in North America. It will attract more girls and women to the sport, as well as encourage those who have represented their national teams to help expand the sport into schools, in the USA and Canada. 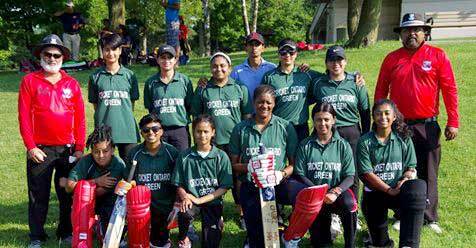 Congratulations to the Ontario Green, 2018 Canada Day Cup champions, and kudos to the organizers, sponsors, umpires and league officials, as well as other supporters, family members, and fans, who came together to make the inaugural Canada Day Cup 2018 for women, such a success.